Would You Give a Kidney to a Facebook Friend? She Did. Spring Break in Krakow? Gerstein Winner Can’t Wait. 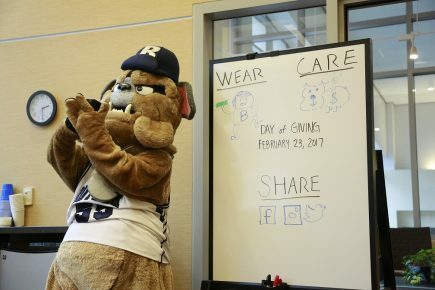 Butler University’s second annual Day of Giving shattered expectations, with faculty, staff, students, alumni, parents, and friends making 887 gifts totaling more than $137,000. In addition, the University was able to “unlock” more than $103,000 in challenge funding. -The $25,000 Scholarship Challenge. Trustee Rick Cummings ’73 and his wife, Martha, pledged to match the first $25,000 in donations made to the General Scholarship Fund. In addition, thanks to a pledge from Trustee Lynne Zydowsky ’81, the University was able to unlock another $3,500. -The $20,000 Scholarship participation challenge. Butler received more than 800 gifts, which unlocked the $20,000 in scholarship support.